Many jellyfish and other gelatinous animals go unnoticed by those who visit the ocean. Like this "herd" of cubozoans in the picture above, gelatinous animals are often difficult to see. However, they are important members of marine ecosystems. For instance, box jellies are known to eat fish, worms, and crustacean arthropods. When the tentacles, which can stretch to ten or more times the height of the bell, come into contact with prey, nematocysts fire into the prey's skin. Tiny barbs of the nematocysts hold onto and transfer venom to the prey. As the prey is immobilized by the venom, the tentacle contracts and pulls the prey near to the bell. Then, an amazing thing occurs. The muscular pedalium bends and pushes the tentacle and prey into the bell of the medusa. The manubrium then reaches out for the prey and the mouth expands and engulfs it. The entire feeding process is relatively fast, taking place in as little as one minute. Cubozoans are not quite at the top of the food web, as they are sometimes eaten by large fish and sea turtles. Cubozoans are active and agile swimmers. Jellyfish are typically referred to as planktonic, meaning that their swimming is not strong enough to prevent them from drifting with currents. As a consequence, many jellyfish wash up on beaches. However, box jellies are very rarely found on beaches. This is because they are unusually strong swimmers. It has been reported that large specimens of Chironex fleckeri can swim as fast as two meters in one second. However, that speed has not been confirmed. Cubozoans (of various sizes) have commonly been observed to swim a meter in five to ten seconds. Presumably, cubozoans use strong muscles, as well as the Velarium, to achieve these speeds. Not only are cubozoans fast, but they are remarkably agile. They have been reported to maneuver around the pilings of peers and to flee would be human collectors. These behaviours can only be achieved because cubozoans have vision. Few experiments have been tried in order to determine how well cubozoans can see, but it is clear that they can see well enough to avoid swimming into things and being captured. It is also likely that they can see eachother, which might help explain some interesting observations about their mating. Some species of cubozoans appear to pair up, male with female, in order to mate. 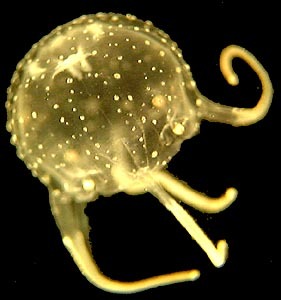 The male puts his tentacles into the bell of the female and appears to pass packets of sperm. At least one other species has been observed in large mating aggregations. Mating appears to occur once every year. Fertilization takes place inside the females. In some species the fertilized eggs are released into the water column where they develop into planulae, while in others development into planulae occurs inside the female. Planulae swim in the water column for a few days and then settle on to the substrate. After settlement, the planulae grow into polyps. The polyps can move around, and they frequently bud off additional polyps. After a few months of feeding, the polyps are mature. Then, each polyp metamorphoses into a single juvenile medusa (above right). During metamorphosis, the polyp tentacles are resorbed and four new tentacles and four rhopalia are formed. With a couple of contractions, the entire individual becomes detached and swims away as a juvenile medusa. Arneson, A. C. & Cutress, C. E. 1976. Life history of Carybdea alata Reynaud, 1831 (Cubomedusae). In Coelenterate Ecology and Behavior, G. O. Mackie ed., pp. 227-236. Plenum Press, New York. Hamner, William, M. 1994. 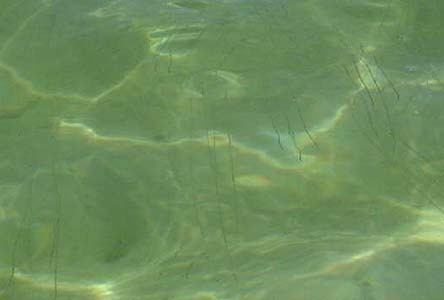 Australia's box jellyfish, a killer down under. National Geographic. August 1994. Hartwick, R. F. 1991. Observations on the anatomy, behaviour, reproduction and life cycle of the cubozoan Carybdea sivickisi. Hydrobiologia 216/217: 171-179. Kinsey, Barbara. 1985. Barnes on box jellyfish. published by James Cook University of North Queensland. Kinsey, Barbara. 1988. More Barnes on box jellyfish. published by James Cook University of North Queensland. Larson, R. J. 1976. Cubomedusae: Feeding - functional morphology, behavior and phylogenetic position. in Coelenterate Ecology and Behavior, Mackie, G. O. ed., Plenum Publishing Co., New York. Matsumoto, G. I. 1995. Observations on the anatomy and behaviour of the cubozoan Carybdea rastonii Haacke. Mar. Fresh. Behav. Physiol. 26, 139-148. Werner, B., Cutress, C. E. and Studebaker, J. P. 1971. Life cycle of Tripedalia cystophora Conant (Cubomedusae). Nature 232: 582-583.